Local basketball fans are going to have to wait a little longer for some more YAIAA playoff action. The boys semifinals, which were originally scheduled to take place Tuesday night, were moved to Thursday because of inclement weather. The boys' semifinals will still take place at Red Lion High School. That pushes the championship game to 7:30 p.m. Saturday at York College. The girls' matchups are set for Wednesday at Dallastown, as originally scheduled. The games should be worth the wait, as the eight teams remaining on both sides have been among the most consistent and dominant teams all season. On the boys' side, upstart Spring Grove will take on Division II champion Northeastern in the first contest before red-hot Eastern York tries to upset Division I champ Central York. For the girls, Susquehannock looks to finally beat Central York after losing to the Panthers twice this season, while Delone Catholic tries to upset Red Lion and earn a berth in Friday's championship game. Here’s a look at the semifinal matchups. The skinny: Is the third time the charm? That’s the question the Warriors will be asking themselves when they square off against Central. Susquehannock has been one of the league’s biggest surprises, going undefeated in Division II play and losing only two games the entire year. But Central has served as Susquehannock’s kryptonite this year, defeating the Warriors on Dec. 21 and Dec. 30. Emma Saxton and Nikson Valencik — along with Sarah Sepic off the bench — have been keys to the Panthers' success this season. Ashley Stone has helped carry the Warriors to their undefeated record in division play and held her own in a head-to-head matchup with William Penn's Chyna Steele last weekend in the playoff quarterfinals. The skinny: Delone Catholic had a pretty impressive win on Saturday, beating York Suburban by five points in a close, hard-fought game. But the Squirettes will need to give a much greater effort Wednesday if they are going to upset Red Lion. The Lions are coming off a 19-point win over West York in the quarterfinals and have lost only twice this season. 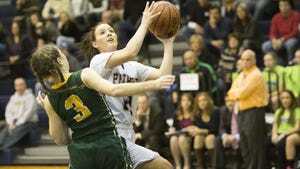 Senior Courtney Dimoff can shoot from anywhere on the court and has seldom been slowed down this season. If Red Lion stays focused and doesn’t start looking ahead to the title game too soon, they should win Wednesday’s matchup. If the Squirettes are going to pull off the upset, they’re going to need to shoot lights out from behind the arc. Delone hit five 3-pointers against York Suburban, including three from Katie Laughman, but it’s going to need even more against Red Lion. Girls' championship game: 7 p.m. Friday at York College. Watch the game live at GameTimePA.com. The skinny: Northeastern has handled every challenge thrown its way this season. The Bobcats went undefeated in Division II, beat district leader Central York and redeemed themselves for their loss to William Penn by throttling the Bearcats by 29 points in the YAIAA quarterfinals last Friday. Now, they face a different challenge in the league's leading scorer Eli Brooks and the Spring Grove Rockets, who've won 10 straight and have lost only to Central York this season. For their part, if the Rockets want a potential third matchup against the Panthers in the finals, they'll have to get past Northeastern, and that won't be easy. The Bobcats have a deep cast of contributors led by 1,000-point scorer Kobi Nwandu, and they’ve proven they can beat Division I teams. To get past them, the Rockets will need such players as Darin Gordon and Grant Wierman to help Brooks carry the scoring load. Brooks scored the Rockets' first 14 points in Spring Grove's quarterfinal win against Hanover, but he won’t be able to do everything himself this time. However it shakes out, this is arguably the premier matchup of the semifinals. Both teams are deep, talented and won’t be scared of each other. The skinny: Eastern should present a much tougher challenge for Central than West York did last week. Both Eastern and Central are coming off of relatively lopsided wins to open the league playoffs, and are expecting a tough battle when they go head-to-head on Thursday. The two sides haven’t seen one another since Dec. 5, when the Panthers downed the Golden Knights 61-41, but Eastern has improved greatly since that first meeting. The Panthers have benefited from the strong play of Jared Wagner, who has 18.4 points per game this year. He started slow against West York, but a team effort helped them overwhelm the Bulldogs anyway. Boys' championship game: 7:30 p.m. Saturday at York College. Watch the title game live at GameTimePA.com.